As we previously said in our post 25 Reasons to Love Yourself, it is important to love yourself as much as to love others. Loving yourself is about treating your own well and to be your own best friend. Loving others is about caring, share & accompany, get & give. No matter who do you love, we bring you this 2018 Best Valentine’s Day Gift List Ideas for HIM & HER. Saving some $$ for Valentine's Day: the items from this gift list have an additional 15% off their current price. Use the promotional code LOVEMONTH at checkout to take advantage of the special sales! Has he ever complained about neck or back pain after a long day at work? Besides offering a massage to comfort him, you can get him a standing computer desk to help solve this problem. 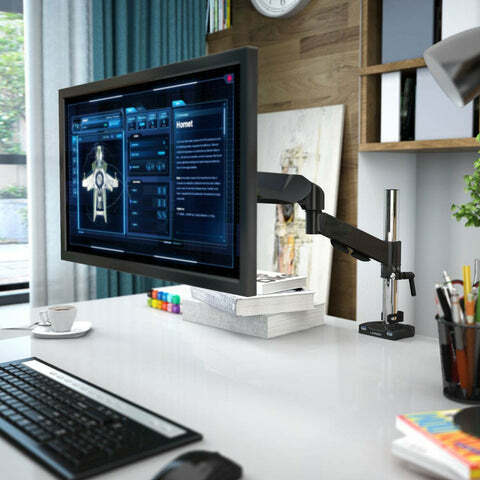 This desk converter has sturdy construction and spacious working surface. He will be able to raise and lower the desk smoothly at his desired height between 5-17.5 inches to stand during work. Some proved benefits of standing while working are: helps improve blood circulation, increases energy and productivity at work. You can get it here. 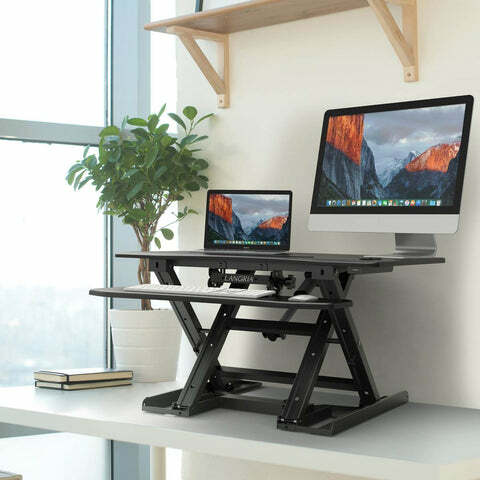 If you prefer an electric option, check this other standing computer desk, with additional 15% off too! Is your Mr. Handsome always caught up on business trips? Do you love traveling the world together? We have the perfect and most thoughtful Valentine's Day gift: an ergonomic travel pillow. 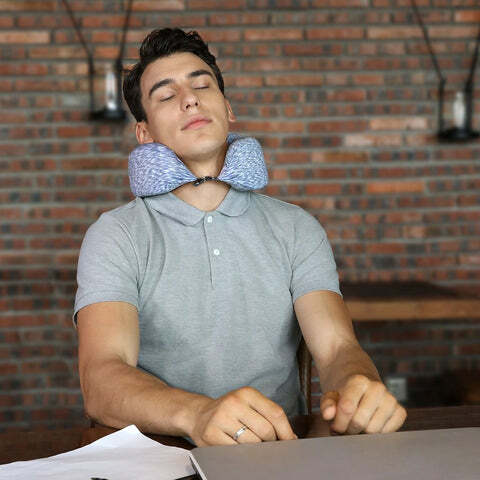 This U-shape travel pillow is made of memory foam and has an ergonomically contoured design, which molds to the neck for ultimate comfort, avoiding shoulder stiffness. Every time he flies with this pillow, he will think of you! Choose your favorite among the five available colors and apply the discount to get it for only $12.74. Have you ever noticed what it looks like inside his closet? If everything is in order and clean, wow! you have found the one in a million! If not, don’t worry, he just needs a garment rack. 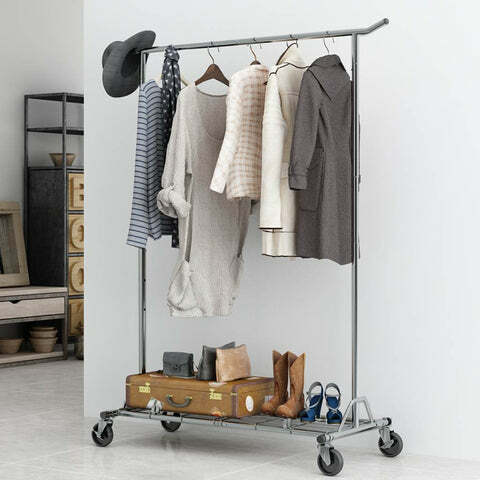 This LANGRIA all-metal rail garment rack is a perfect addition to use in the bedroom, dressing room or by the entrance as a spare open closet for his seasonal outfits. Don’t forget to use the code LOVEMONTH at checkout to get 15% Valentine’s Day off!. We spend too many hours seated: at work, to study, in our cars, public transportation or at home. If your other half has bad sitting habits, you can get him a contoured orthopedic lumbar back cushion to correct those bad habits. 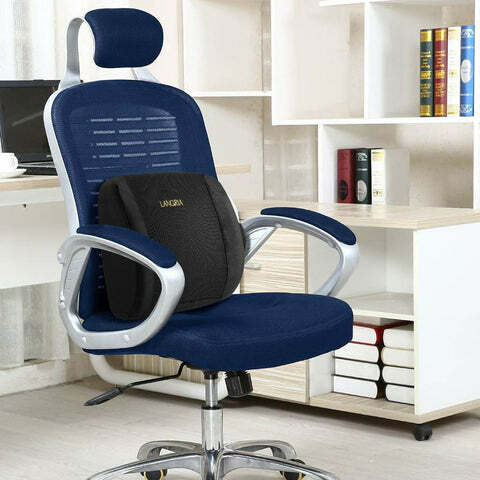 Just by adding this extra layer between the body and the seat, he can immediately relieve the pressure and pain experienced. He will definitely thank you for this one! See more details and get it at an amazing discounted price! Is she a romance lover? 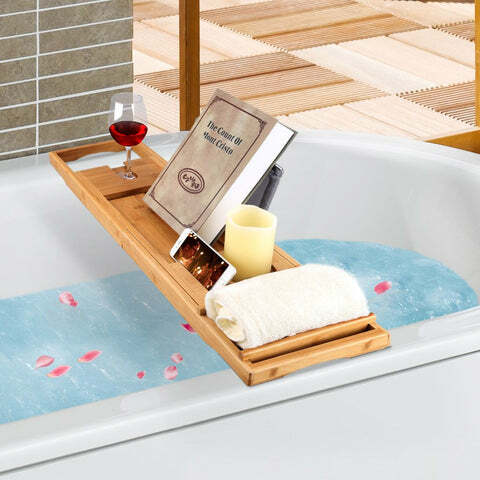 Pamper her with a delightful home-spa experience with this new LANGRIA 100 % bamboo bathtub tray. The tray has a slide-in wine glass and a book holders, a round support to place soap, candles or a cup of tea and some frontal slots for the phone or tablet. Add some scented bath salts, pour some wine, play soft music, and surprise her. Get one for her with our 15% offer on Valentine’s day! Is she a cute & playful one like Disney's Princess Ariel? Then, this full-body mermaid tail blanket might be of her taste. This extra-long mermaid flannel blanket has a very life-like design thanks to the sequin details all over the tail and halter top that create the scales. It is made of eco-friendly polyester microfiber, which is ultra-soft, skin-friendly and always keeps your loved one cozy and warm. It is available in pink, blue, green, purple and dark purple colors and all on big sale! Keep the code LOVEMONTH in mind and get one for only $20.39! Has your sweetheart ever complained that she forgot again where did she put her earrings or favorite lipstick? Have you ever seen her fight with her necklaces to untangle them? Buy her a jewelry cabinet, she will LOVE it! This one has a wide head-to-toe mirror and LED lights. The inside is spacious enough for all her beauty accessories and has shelves and drawers for her cosmetics. Getting ready will be easier and faster than ever and you will get rid of playing the “look for the peach blossom lipstick” game. Order yours now and receive it in time for Valentine’s Day for only $118.99. 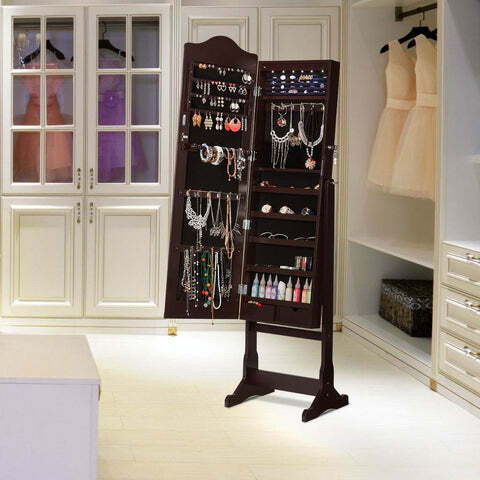 Or check all our Mirrored Jewelry Cabinet Armoire Collection to choose the best one for her. Spring is around the corner after this long cold winter. A stylish blanket with tassels may keep your babe warm for the chilly nights. 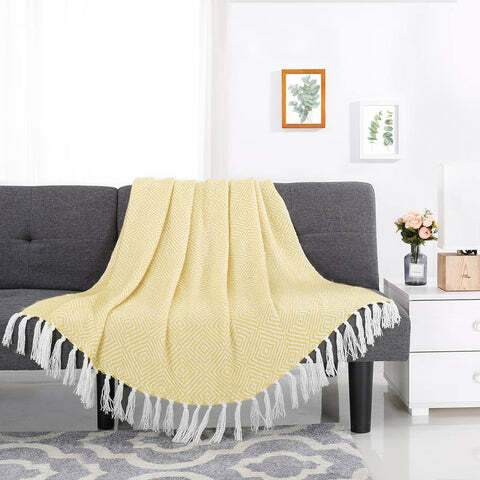 The blanket is lightweight and perfect to use when chilling at home on the sofa, the bed, the backyard and even at the office to wear it over the shoulders. She will fall in love with its soft feeling and beautiful geometric pattern. Remember, the code is LOVEMONTH and you need to apply it at checkout. Shop the blanket here and choose your favorite color. The National Sleep Foundation analyzed that, compared with males, females are more likely to suffer from sleep problems. An ergonomic pillow can help to reduce those problems to offer her a better sleep. LANGRIA’s memory foam pillow with contoured shape molds to the head, reducing pressure points in the body after a whole day’s work. Be a warm, caring boyfriend and look after her sleep and health! Shop her pillow now with extra discount! Did you find the perfect present for Valentine's Day? Not yet? Don't worry, we have an extra surprise for you - our entire website is offering major sales right now! With the code LOVEMONTH you will obtain an additional 15% off their current price. Browse our categories and find that ideal gift! Order before Feb. 7 to make sure you get your Valentine's Day gift on time!